Bring Mommy the Vodka: "HOLY COW!" Those were the two words I heard come from my doctor on the other side of a blue sheet when he pulled Christopher out. I couldn't see my doctor's face, but I'm sure if I could I would see an expression of shock. 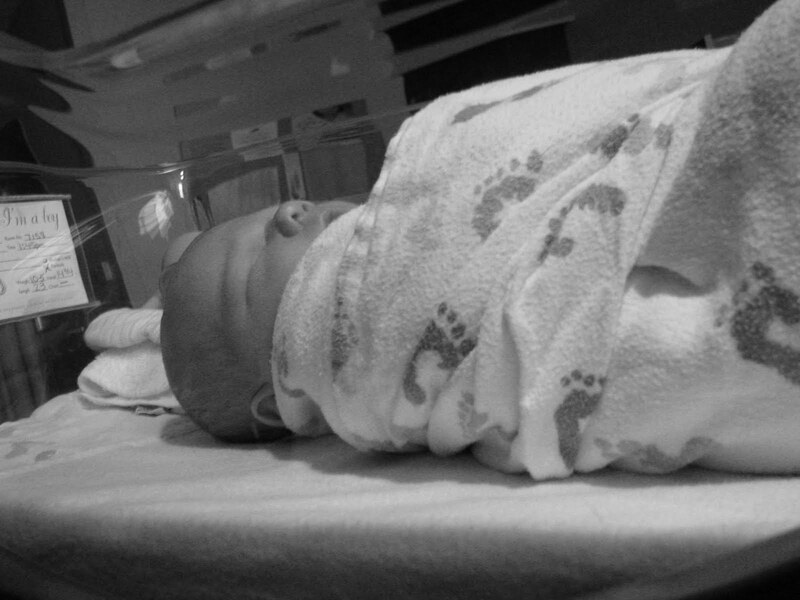 10 pounds, 5 ounces. Who knew? Not me, not Brian, and certainly not my doctor. 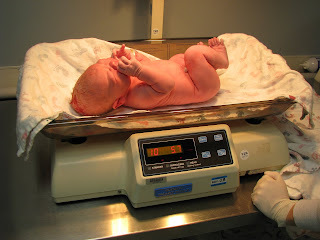 If any of us had guessed he would be that big I would have asked for a cesarean from the beginning. 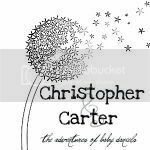 We had scheduled an induction for Monday, April 21st and I guess someone told Christopher because I woke up around 3 a.m. with contractions. They weren't anything like I had expected. They were located in my lower back, and at first I thought I had just slept wrong. When they started to go away and return, I knew things were getting started. I took a shower around 4:30 a.m. and found they were going away. I'd get one an hour, maybe three, but not much more. With the contractions not progressing, we decided to just wait for our call to go to the hospital and continue with the induction. Of course we got the call right as we sat down for lunch at Steak and Shake. I was too hungry, and I knew I wouldn't be able to eat once I got to the hospital so we continued with our late lunch before heading to the hospital. Most of the afternoon was filled with paperwork, questions, and getting things started. Since I had already started contractions that morning Dr. Snowden decided we could started directly with the Patosin. I was only a centimeter dilated, but that was better than any other time before. After the Patosin was started I began feeling contractions right away. They were in no way regular. Some contractions were 10 minutes apart, others two. They did begin to get increasingly worse each time though. 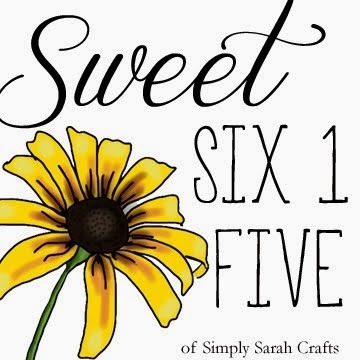 I had prepared myself as much as I could for the contractions; for the unbearable cramps and stomach pains. But what I did not prepare myself for was back labor. And that's exactly what I got. I had absolutely no stomach pains, no cramps. My stomach didn't tighten and I didn't feel anything in the front of my torso. All I felt was pain in my lower spine. As though someone was taking a baseball bat to my back. I'll be the first to admit, I'm a wimp when it comes to back pain, and this was a pain that I had never felt before. I did think that if I got up and walked around things would feel better. If I could sit on the exercise ball I would be able to shift some of the pain. 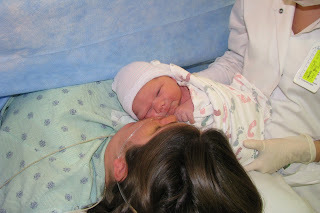 But since I was induced, and on Patosin, I was constantly hooked to the monitors and I couldn't walk around. The one time they tried to put a "portable monitor" on me, it wouldn't read correctly and had to be adjusted every five minutes. So there I was, stuck in bed. By 2 a.m. I had only progressed to 3 centimeters and couldn't take any more of the pain. Maybe (and I only say maybe because I'll never know), but maybe if I had had regular contractions I could have held out. 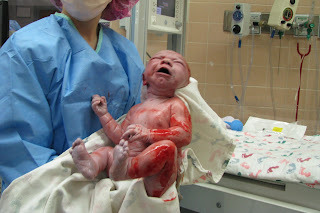 But seeing as how the back labor wasn't about to disappear anytime soon, I asked for the epidural. It's amazing how things change so quickly. The epidural wasn't painful just very very awkward. The feeling of a tube going in your spine will give you the shivers. I had to apologize every time I jerked. Brian seemed to be amazed how he could see the contractions on the monitor, but wasn't hearing my moans of pain anymore. Finally, we got a little sleep. After a three hour nap (with a few interruptions from the nurses to check on vitals) I was awake wondering when things would really start moving along. Around 8 a.m. 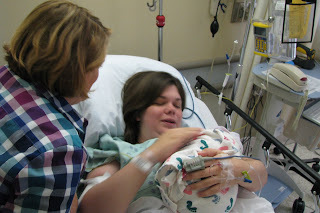 I rolled from my left side to my right, as I was told, to keep the epidural from falling all to one side of my body. In the process of doing this, Christopher's heart rate and mine started to drop. In a matter of seconds I had an intern and three nurses burst into the room and roll me back over to my left side. They immediately took my off the Patosin and gave me an oxygen mask. At this time I was only 5 centimeters and not looking to promising. By 11 a.m. 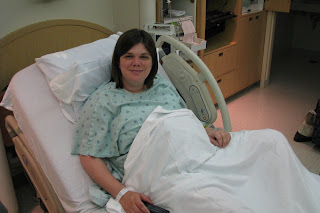 I was back down to 3 centimeters and my contractions were slowing down. 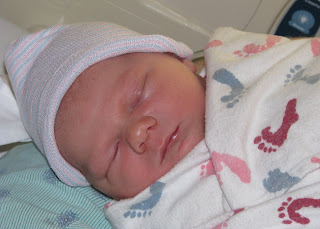 Dr. Snowden suggested it would be best to go ahead with a cesarean. He said it was like a "square peg in a round hole." With as much as the baby wanted to come out, his head was to far down and only causing more problems. I was more than happy at this point to agree. It was then that we knew in a couple of hours we would be having a baby. The paperwork and questions started all over again. More doctors and nurses came and went in the next hour. A new anesthesiologist came in and started a new epidural. He also gave me a liquid to drink to reduce heartburn and nausea during the surgery. I immediately threw up. Shortly I was unable to feel anything from the chest down. And then the shivering began. It was completely uncontrollable. I shivered head to toe, almost jerking an inch from the bed at times. It's strange to have your entire body jerk in such a way where, one - you can only feel it in your shoulders and head, but two - that when you tried to stop it, it only gets worse. I pretty much shook all the way to the operating room. At one point, I thought Brian would never show up. It turns out no one came to get him after they took me to the OR. Finally a nurse brought him down and he showed up in a blue coverall and a yellow face mask. He had the camera in one hand and the baby book pages for the footprints in the other hand. It wasn't long before they put the blue curtain between Dr. Snowden and I and the surgery began. The anesthesiologist was very nice and constantly made sure I was comfortable. Then Dr. Snowden said "You're going to feel a lot of pressure here Sarah and then you'll have a baby." Pressure was right, it was extremely strange, almost as though they were pushing so hard on my gut that I would fall right through the table. Dr. Snowden then said, "Here's the head, and it's a big head, no wonder he didn't want to come out." He then told me the shoulders were coming out and... "HOLY COW! That's a big baby!" Before I knew it the room was filling with Christopher's crying and echos. 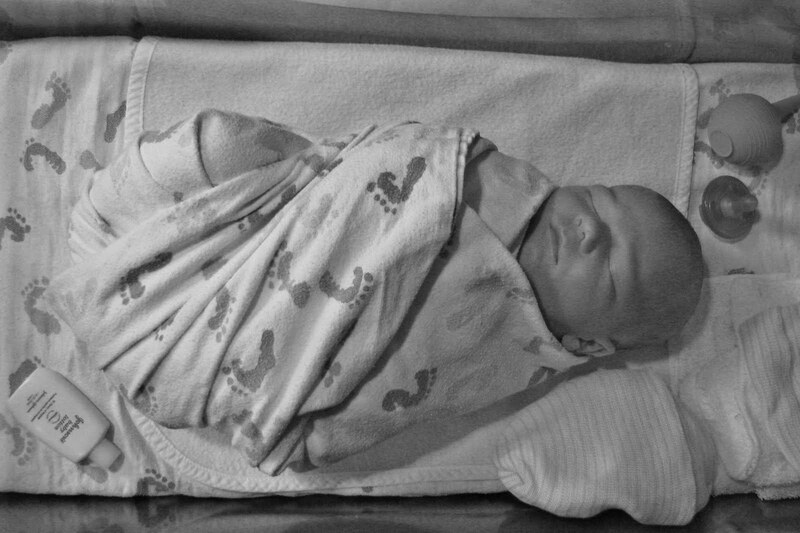 All the nurses were gasping and laughing at the size of our baby. I wasn't thinking much of it at the time. 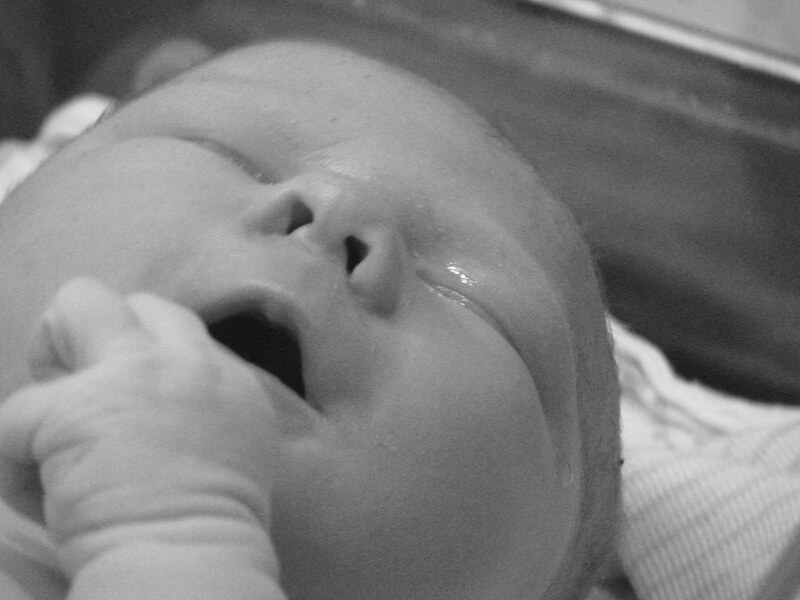 All I could think about was his cry and how I instinctively knew that it was MY baby's cry. I watched them take him to the table and start cleaning him off. 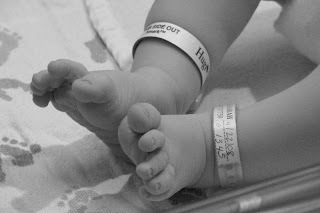 I saw his footprints being taken and I watched the nurse walk behind me with him to get weighed. While he was out of my sight I heard Dr. Snowden say to one of the nurses, I guess 9-7, another nurse said 9-10. A few others added their guesses. Then Christopher was brought back into the room and his nurse shouted "10-5." Again Dr. Snowden exclaimed "Holy Cow!" Everyone else broke out into laughter. It took about 20 minutes (I'm guessing) for them to sew me back up. 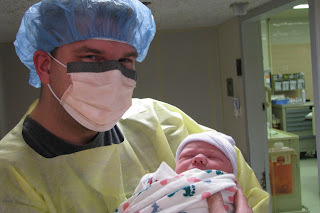 In this time the anesthesiologist took the camera from Brian and took pictures of the three of us. Brian held Christopher as I was able to kiss him on the cheek and whisper in his ear. Shortly, I was being wheeled into the recovery room as Brian walked behind the stretcher with Christopher. Finally I was able to hold him myself. He was beautiful. 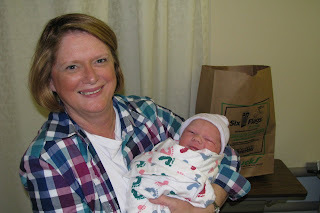 My mom came in soon thereafter and was able to hold her first grandchild. I'd never seen a bigger smile on her face. After 30 minutes of oohing and ahhing, the nursery came to take Christopher to clean him up and check his vitals. My mother sat with me as Brian left to take pictures at the nursery. After the extremely painful recovery room stay, I was moved to my room and greeted by my new nurses. They helped me get settled in, and before you knew it, Christopher was brought back to the room. We spent most of the time just staring at him. 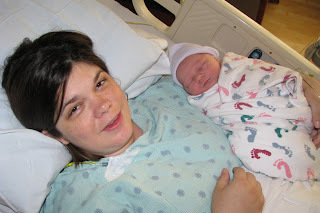 The only reason I didn't want a cesarean was because of the recovery time. I knew I was going to be at the hospital for a while. I ended up staying in the hospital the next four nights (a total of five including the night I was in labor). But the experience wasn't bad at all. The nurses were wonderful and extremely helpful. We received visitors from family and friends over the four days, and saw more when we got home. On Saturday, both Christopher and I received a clean bill of health and were discharged from the hospital. 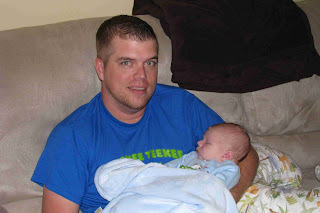 Christopher met my brother Decker (whom he was named after) last weekend, and Brian and I plan on taking him to Chris Brother's graveside in the next few weeks as well. He's already met his Pop (my dad) his Dodi (my mom), his aunt Beth, and his uncle Super Chicken (Stephen). He's just waiting to meet his other uncle Phil along with his GranBob (Brian's dad) and Nana (Brian's mom). But it shouldn't be too long. 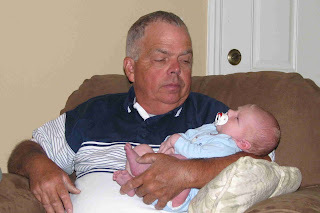 We also plan on taking a trip to Kentucky soon for him to meet his three great grandparents on my side. We've had some wonderful experiences the past few weeks and can't wait to see what the future will bring. I'll be sure to keep posting on here until things don't seem as exciting anymore. But that could be quite a long time. Thank you to everyone who has called and written with wonderful words of love and care. If I haven't gotten back to you, I promise to soon. I just have to find time in between his naps and mine. Love to you all, Sarah, Brian, and Christopher. Beautiful, beautiful, beautiful young boy. i just can't wait to meet him in person next weekend! Happy first month!